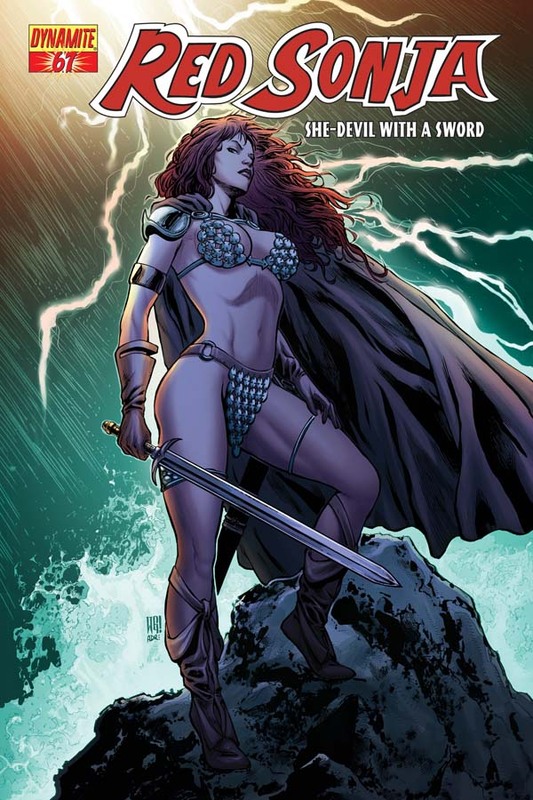 The Fellowship was fortunate enough to obtain a copy of RED SONJA #67 from Dynamite Comics. The story is by Eric Trautmann with pencils by Marcio Abreu and colors by Salvatore Aiala Studios. Red Sonja and her companions are on an uneventful trip aboard The Dancing Maiden, until a violent storm and a sea serpent appeared. Our heroes swim to shore and walking inland. They come across some ruins and other signs of life on the island. They are attacked by a group of men and must defend themselves. Between Sonja’s actions and the re-appearance of the serpent, the battle ends. Our heroes put together a makeshift raft and set out on the sea again. This is the first time I’ve read Red Sonja in a long time and was fortunate to find out that this issue is a prologue to the next story arc. What surprises me about this prologue is it does not have a cliffhanger ending. Granted, there are questions that will more than likely be answered during the upcoming story arc, this is a complete story. Enough information is given to you to get into the story and there is an ending, so kudos to Mr. Trautmann for doing that. This is a good jumping on point if you are interested in reading this comic. RED SONJA #67 is in stores now and available at www.dynamite.net. Discuss in the Review or Editorial section of our Forums.